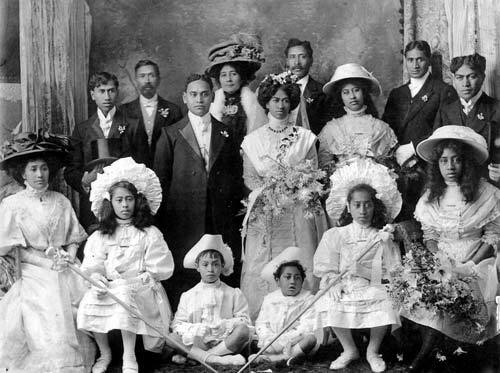 Te Haumihiata Te Atua and Wi Te Tau pose with members of their wedding party in 1909. The men are soberly dressed in dark morning suits, shirts with wing collars, and bow ties. The women wear more elaborate clothes decorated with lace, frills and tucks. The bride's attendants are all in white. All the women, apart from the bride, wear large decorated hats, while the two page boys are dressed in clothes that mimic European clothing of an earlier era.